Tuberous begonias are popular plants in a home garden. They prefer part shade and will grow robustly in pots, hanging baskets, window boxes and flower beds. There are many different color and shape varieties of tuberous begonias and these easy-to-grow plants will show delightful color continually throughout the growing season. 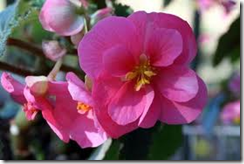 If you will be starting the begonias from seed, start them inside approximately two months before the last frost. Use pots with drainage holes and fill the pots with quality potting soil. Place the indented side of the tuber into the soil, facing up. Place approximately 1 inch of soil over the tuber and water well. Keep the soil moist, but not soggy, and place the pots in a location that is around 70 degrees. When you see sprouts, place the pots where they will either receive sunlight or under growing lights. Fertilize the new plants with liquid fertilizer every other week. When frost threat is over and you are ready to transplant the begonias outside, you will need to adjust them to the conditions outside, called hardening off. To do this, move the pots to a shady location that is protected from wind and rain. Over the course of a week, gradually begin to move them from the protected area out to where they will receive some sun and some wind. After a week of hardening, place them in their final location. If you’re planting seedlings you bought from a nursery, begin by hardening them in the same fashion as seedlings started inside. Choose a planting area that receives part shade and part sun. The soil should be dense in nutrients and well-drained. Find a place for the begonias that is not subjected to high winds. If planting in pots or containers, use a quality potting soil and make sure that the pots are sheltered from high winds. Plant the seedlings in the ground or the containers at the same level as they were growing in the temporary pots, to ensure that rotting does not occur. Keep the plants evenly moist. If begonias are in containers, make sure that the soil stays moist every day. If begonias are in flower beds, monitor the rainfall and if less than 1 inch of rain falls, supplement by watering the plants with a hose or watering can. Fertilize every other week with a liquid fertilizer. 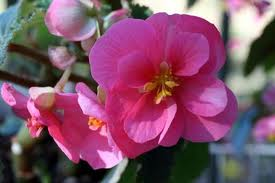 Remove the spent blossoms to encourage the begonia to continue to bloom throughout the growing season.